Heat the oil in a skillet over medium-high heat. If you are using regular pasta, start it now. Cut the chicken breast into bite-sized pieces. Season it with garlic powder, kosher salt, and black pepper. Cook the chicken in the oil for 3-4 minutes undisturbed. Flip the chicken pieces and cook an additional 3-4 minutes until lightly browned. Set the chicken aside. Rinse your skillet, reduced the heat to medium, and melt the margarine in the skillet. Sauté the mushrooms for 5 minutes, stirring occasionally to ensure even cooking. Add the garlic, and sauté briefly until fragrant (about 30-60 seconds). Add the starch, and stir enough to coat the mushrooms and garlic. Pour in the milk, parmesan cheese, and cream cheese, stirring until smooth and thickened (about 2 minutes). Add the lemon juice, lemon zest, salt, and pepper. Taste and adjust the seasonings if needed. Cover the sauce, and remove the skillet from the heat. Rinse the shirataki noodles (or regular pasta) thoroughly with hot water, then drain them in a colander. Transfer the noodles to a large bowl, and toss them with alfredo sauce. 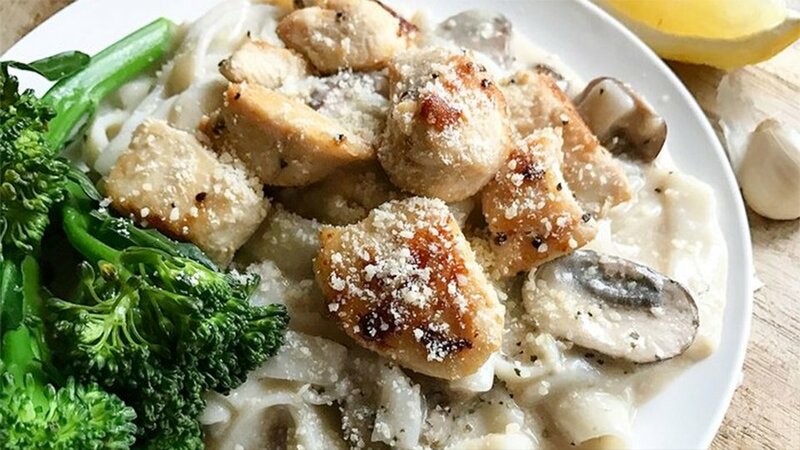 Portion out the fettuccine alfredo, and top it with cooked chicken. Garnish each portion with more parmesan and black pepper if desired. Top with 3 ounces of cooked chicken.